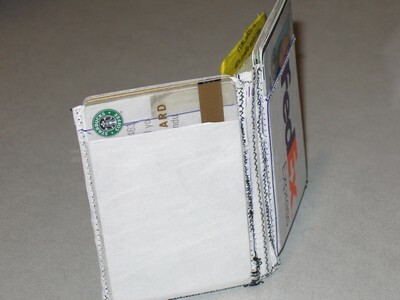 I've been reading up on Tyvek, and after seeing an instructible on creating a Tyvek wallet from a FedEx mailing envelope, I decided to make my own. 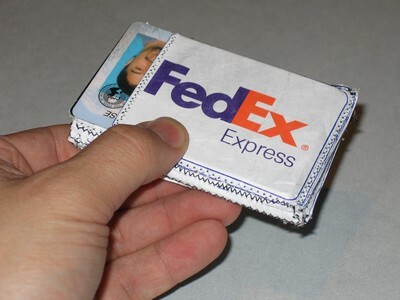 The instructible focused a bit on ease-of-creation, where the adhesive that comes with the envelope is used with the creation, such that very little extra material is necessary. I think that's very clever, but as much as I like the idea of a simple design, I need functionality. Also, I own a sewing machine, which gives me a tremendous amount of flexibility in creating something like this. I played around with a few ideas for a design, and finally settled on a vertical bi-fold wallet, with pockets inside and out on both walls. I also created a sleeve for bills. The overall design is spartan, focusing mostly on size and ease of use. Here's the front of the wallet. I put my ID card and my Costco card there on the front. This shot is the outside, where you can see that both the front and the back have pockets for cards. I keep a Starbucks card (I think it's empty, actually...) and my Blockbuster Video card in the back. On the inside, I have my three Bank of America Visa cards (two debit, one credit) on the right side, and my insurance card and six paper business cards on the left. You can also see the yellow card from Lassley's Used Books there in the sleeve. In addition to the book store card in the sleeve, I also keep my paper money and other random bits of paper. In total - eight plastic cards, seven paper cards, four paper bills, and two receipts. All that, crammed into 9cm x 6cm x 1cm. That's smaller than an Altoids tin. 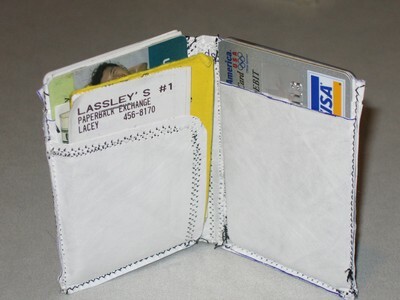 This particular wallet is still technically a prototype. In a final version, the stitching won't be as visible, and I might come up with a better way to join the two sides of the wallet, so the spine doesn't look so rough. Very Nice, I like the compact size of this one!! Yeah -- me too. I keep going back and forth with another design that a buddy of mine is using. 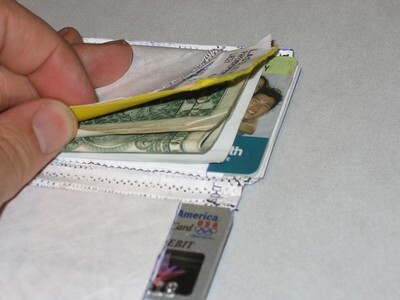 His is similar to yours, in that it's got a horizontal layout, which makes it... wallet-sized, which I guess is the goal, but I've always felt that traditional wallets are too big.